If you’re looking for stitching suggestions for this series of monograms, please check out the Letter A, where I’ve mentioned a few ideas for stitches. Also, if you have any ideas or input for stitching these letters, feel free to leave a comment! 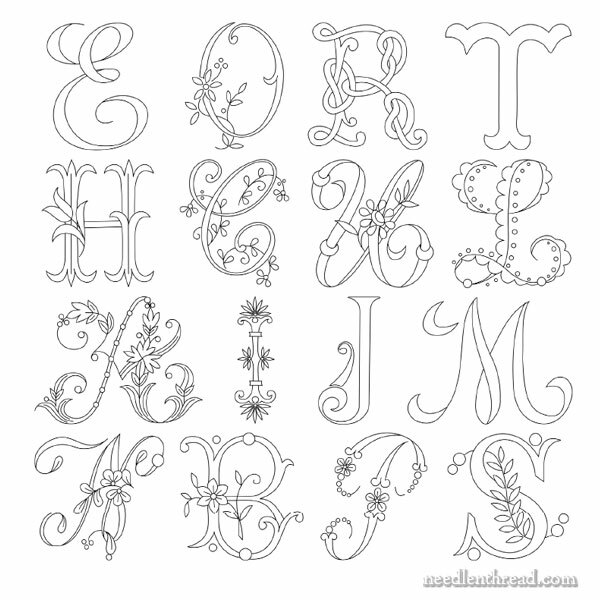 Feel free to visit the Index of Monogram Designs here on Needle ‘n Thread, if you’re looking for more monograms, including the rest of this alphabet. Hi, Wayne – it’s here, under C: https://www.needlenthread.com/2008/06/free-pattern-monogram-for-hand_27.html If you click on any of the letters in the index (which is here: https://www.needlenthread.com/2008/06/monograms-for-hand-embroidery-index.html) it’ll take you to the right one. Previous Previous post: Reader’s Embroidery: Beautiful Christening Gown Set!